I've been travelling again this month and just arrived back from my eastern Canada book tour with my Genuine Health friends. While in Ottawa, I met the lovely Michelle, a passionate healthy foodie at a workshop I was teaching at Pantry Plus. She gave me a copy of her cookbook and I immediately fell in love with her granola recipe. I asked her if I could share it with all of you and lucky for us, she said yes! One of the reasons I love Michelle's recipe is that it's totally gluten and grain-free. For those of you who suffer from digestive disorders, grains can be big-time trouble and promote inflammation, bloating and pain. Even if you don't have any tummy troubles, you'll love this recipe because it's nourishing, rich in nutrients, low in sugar and very easy to make. You'll save some dollars too when you make your own granola! Mix together nuts, chia and coconut in a large bowl and set aside. In a small saucepan over medium heat, mix orange juice, maple syrup, coconut oil and applesauce until everything has melted together and is well combined. Pour liquid ingredients over dry seeds and nuts. Pour granola into a deep baking sheet lined with parchment paper and spread out evenly. Bake for 40-50 mins or until granola is golden brown, making sure to stir every 15 minutes because the outside edges end to brown faster. Allow to cool completely and mix in ground flax before storing in an air-tight container. *The reason I suggest you add the ground flax AFTER you've baked it to prevent any rancidity of the fats. Alternatively use ground almonds, otherwise known as almond flour. Another option: Whole flaxseeds can be heated lightly as the phytonutrients protect the good fats. JOYOUS OPTION: I would suggest you zest some organic orange peel (about 2 tbsp) and mix that in to the granola as that would really bring out the orange flavour! Pour hemp, coconut or almond milk over top and sprinkle with some fresh berries. Mix with a few dollops of sheep's milk or goat's milk yogurt. I buy sheep's milk yogurt from Brickwork's Farmers Market every weekend. Sheep and goat milk products contain 89% less problematic casein compared to cow's milk products. Add some kefir -- fermented cow's milk yogurt. You can also get coconut milk kefir and yogurt too for a vegan option. Use as a topping for your next smoothie. 4 tbsp, adds a nice crunch! 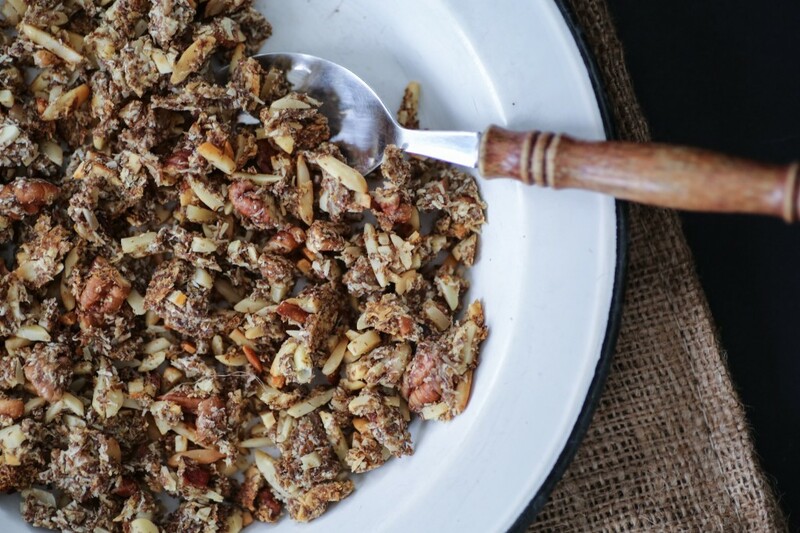 Hi Joy, I'm making this granola right now, it smells so good! Just wondering how much would a portion be, would 3/4 cup be too much? I got some hemp milk to go with this, can't wait to try it out! Two-Bite Chocolate Chip Nuggets, Nut-free!